Good morning! 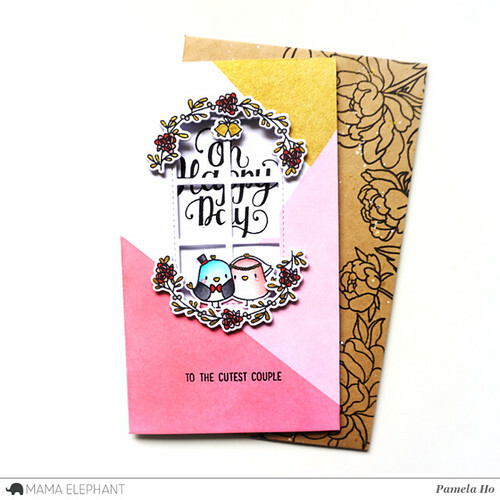 This is our last stamp highlight for Mama Elephant‘s June release. I hope you all got some wonderful inspiration from the design team! 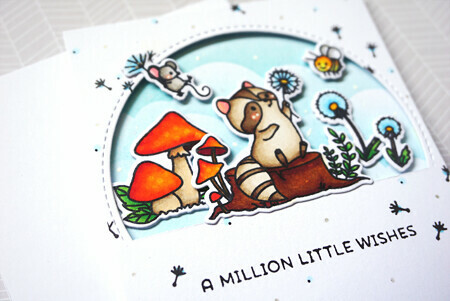 Today, we’ll be looking at the adorable Dandelion Wishes stamp set and its coordinating die cuts. 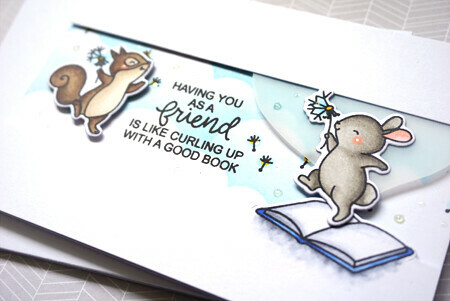 This is my favourite stamp sets from this June release, and this card is definitely one of my favourite from the June projects! I decided to create a multi-layered card with a scene. 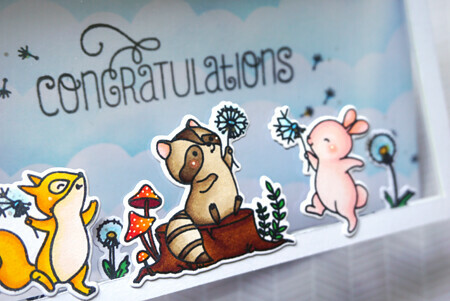 First, I stamped out the critters and coloured them. Using the partial die cut method, I cut the squirrel, tanuki and rabbit out from a piece of long cardstock, and adhered my coloured critters onto the cardstock. Next, I did some more partial cutting with the dandelions from the front of the cardbase. I slipped a piece of acetate between the two layers and used foam tape to put the 2 layers together. 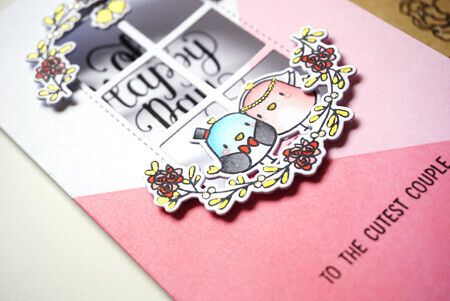 For the background, I used the On The Hills creative die cuts and blended some blue ink for the clouds. To finish off the card, I stamped a sentiment from Bountiful Blessings and the loose dandelions from Dandelion Wishes. Good morning! 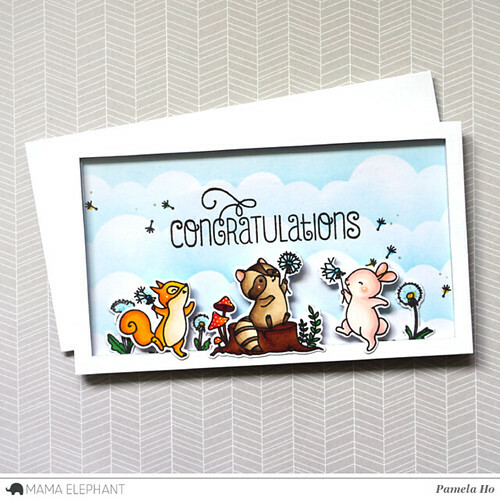 Welcome back to another stamp highlights featuring the gorgeous Garden Frame. I decided to do a very simple card and started off by blending some ink onto my card base. Instead of a solid colour, I went for an ombre pink and splashed some white paint and water onto the background. 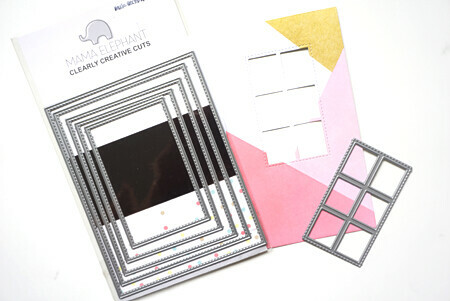 I love that they gave us the option of die cutting the inside out and having it as a frame, or leaving the inside as is! For my card, I decided to cut out the inside for a true frame and stamped the sentiment directly onto the card base. After adhering the frame, there was still room near the flowers, so I decided to colour and cut out a few more flowers and positioned them underneath the original flowers from the frame. 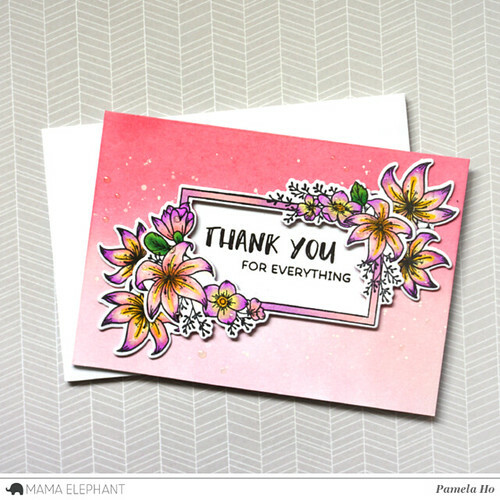 Hope you like my card and thanks for stopping by! Hello everyone and good morning! 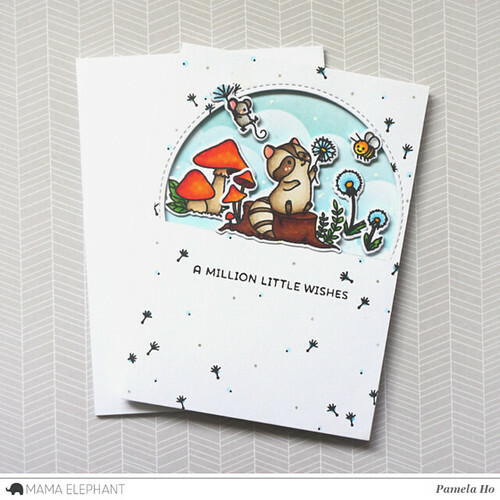 I’m back with a card using the newly released Mama Elephant stamp set. Today, we’re taking a closer look at Good Reads. 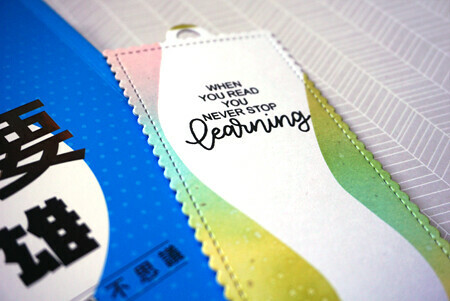 This is the perfect stamp set for creating bookmarks and I just love all the sentiments on there. For my project, I created a very simple card using the new Dandelion Wishes as well as Good Reads. 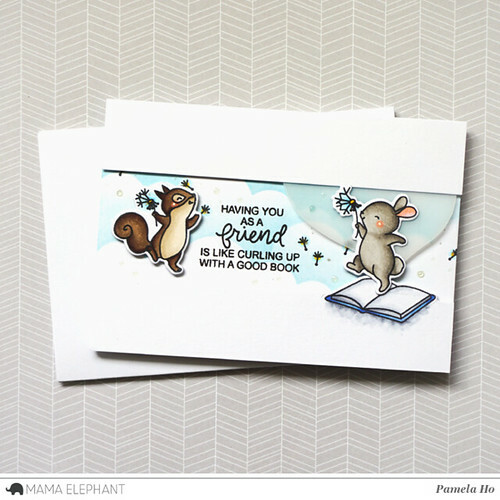 I wanted to create a simple scene where Mr Rabbit is coming out from the book to meet his squirrel friend! 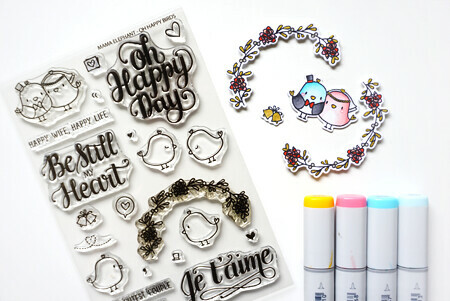 Welcome to our last stamp highlight and if you love big calligraphy, this is the stamp set for you! 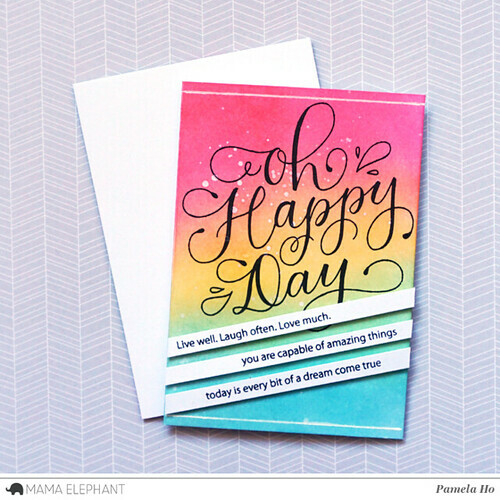 For May, Mama Elephant released another large sentiment stamp set called Oh Happy Day and it totally fills up the card front! 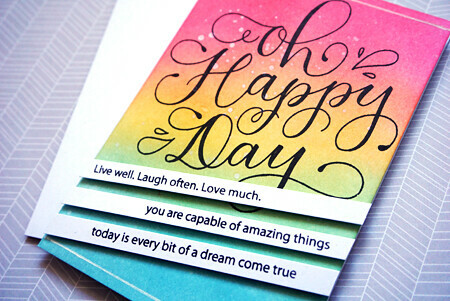 I wanted something happy and blended a rainbow for the card front. I just stamped the sentiment right on top of the card and was about to call it finished… but it felt so bare and was missing something. 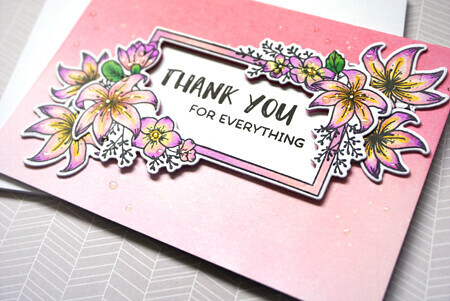 So I took the smaller sentiments and stamped a few of them onto some strips of cardstock and adhered it with foam tape diagonally to give it that little pop of white against that background. 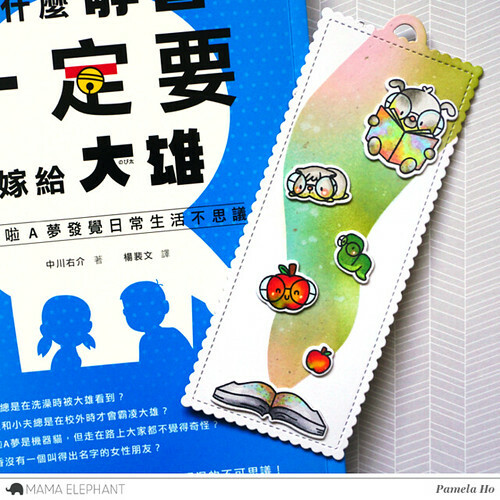 Hope you enjoyed the stamp highlights for May!